Stores often have products - like nutrition - that are bought in bulk but are usually sold individually. So how do you mark those in Ascend? It's actually pretty easy once you know how to set it up! The first thing you need to know is the difference between In-store products and vendor products. In-store products hold information related to selling and stocking a product (such as MSRP, category, commission). And Vendor products contain information related to ordering a product (such as vendor's cost, case quantity, part number). 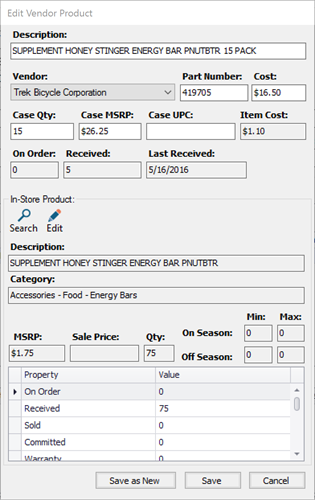 Each in-store product record can have multiple vendor products. The in-store product is what you're selling to the customer - and in this case, you'd set up the in-store product for a individual item. But the vendor product(s) would be set up for the case that you buy for your store. When you create a new vendor product for an in-store product, the Case Quantity field defaults to one. If your store buys this product in bulk, change Case Quantity to match the number of individual items that come in the case (in this situation, we changed it to 15). IF needed, you can add mutliple vendor products for different size cases (such as a 25 item case and a 100 item case) or individual products and a case. As soon as you update that field, the Case MSRP and Case UPC fields become active. You definitely should fil in the Case UPC field, so Ascend is able to differenate between the case and the individual items when you scan the barcode. If the bulk item only has one UPC (Case UPC) we recommend using the instore SKU for the individual instore product you sell in your store. 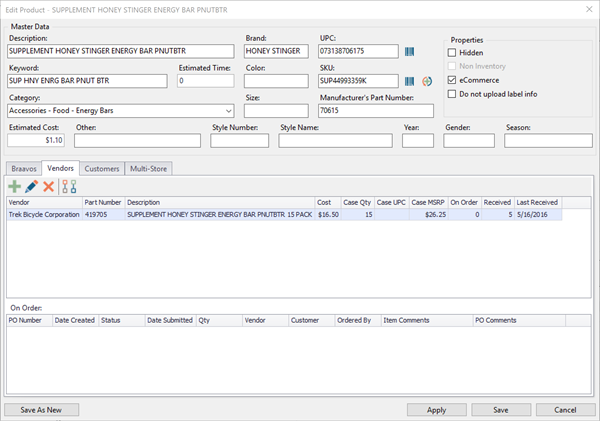 Leave the instore product UPC field blank and fill in in the vendor product Case UPC field. If the actual case can be sold in your store (like if someone want to by the whole box of engery bars! ), we recommend filling in the Case MSRP field as well. Even though that information is in the vendor product, Ascend will fill in the correct MSRP if you scan the full box in a sale.